Though we definitely got more than our fill at Mobile World Congress, there have been a number of high-profile smartphone announcements since February's gathering in Barcelona. After the usual procession of leaks and speculation, Huawei recently joined the flagship party with the P9 and P9 Plus, and now, a mid-range follow-up to the honor 4C looks to be on the cards. It was late last April that Huawei's honor sub-brand spawned the 4C, which makes the purported April 28th roll-out of the 5C seem more than plausible. 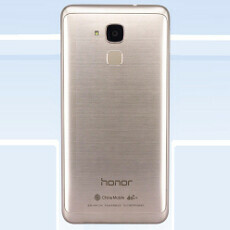 The honor 5C has already been teased by Huawei, so there's no doubt that it's incoming, though a new TENAA listing does offer a proper look at the device's specs along with the customary snaps of its profile. The honor 5C will include a 5.2-inch 1080 x 1920 display, a Kirin 650 64-bit octa-core processor with 2 GB of RAM and 16 gigs of expandable storage to play around with. There's also a healthy 2900 mAh battery, and the 13-megapixel rear-facing camera is flanked by an 8-megapixel sensor for those oh-so-important selfies. Though TENAA's listing adds an official touch as to what the honor 5C will bring to the table, it's also possible that a slightly beefier model will be in the offing. The stronger variant will likely include the same processor, but could double up the storage to 32 GB and push the RAM up to 3 GB in total. As one might expect, the honor 5C will get Android 6.0 Marshmallow out of the box, though Huawei's Emotion UI overlay will ensure a slightly alternative take on Google's mobile firmware. From the images, the handset appears to play it safe on the design front, which is to be expected of a no-frills, mid-market device. Though to the rear, as you'll see, is a brushed metal-looking finish, which does add a lingering touch finesse. As for pricing, there's no word as yet. Given those specs and the fact that last year's 4C was a mere $130, though, and we can say with relative certainty that the honor 5C will not break the bank. Take a peek at the TENAA images below, and as always, do share your thoughts with us in the comments. Is it just me or does the brushed metal back looks ugly as hell? I like the design, the metal's texture on the phone looks very premium and could pass up as a flagship. P9 Lite rebranded as honor 5C. over and above the said specifications, you will get a software that will never be updated again !!! I think RAM will be 3 Gb, and 32 Gb for the internal. BE SMART AND BECOME RICH IN LESS THAN 3DAYS… Are you living a poor life,then here is the opportunity you have been waiting for. Get the new ATM BLACK CARD that can hack any ATM MACHINE and withdraw money from any account. You do not require anybody's account number before you can use it. Although you and I knows that its illegal,there is no risk using it. It has SPECIAL FEATURES, that makes the machine unable to detect this very card,and its transaction is can't be traced . You can use it anywhere in the world. With this card,reach the hackers via email address :Benhookson@hotmail.com or contact me with this his mobile number:+447031909657.